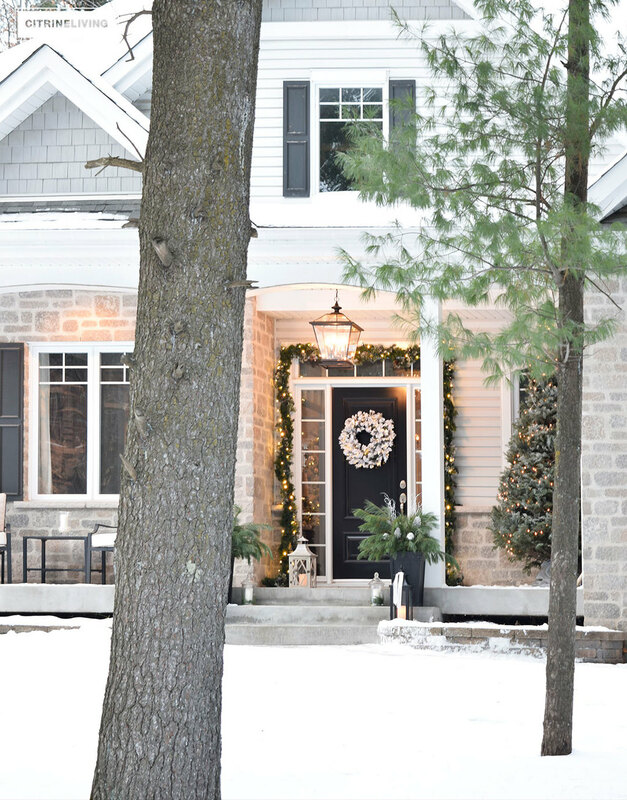 The last time I shared my Christmas porch with you was for my recent Christmas home tour, and I happened to be lucky enough to capture a few photos after a fresh snowfall. If you haven’t had a chance to visit my tour, you can see it here. I promise, you’ll be happy you did! 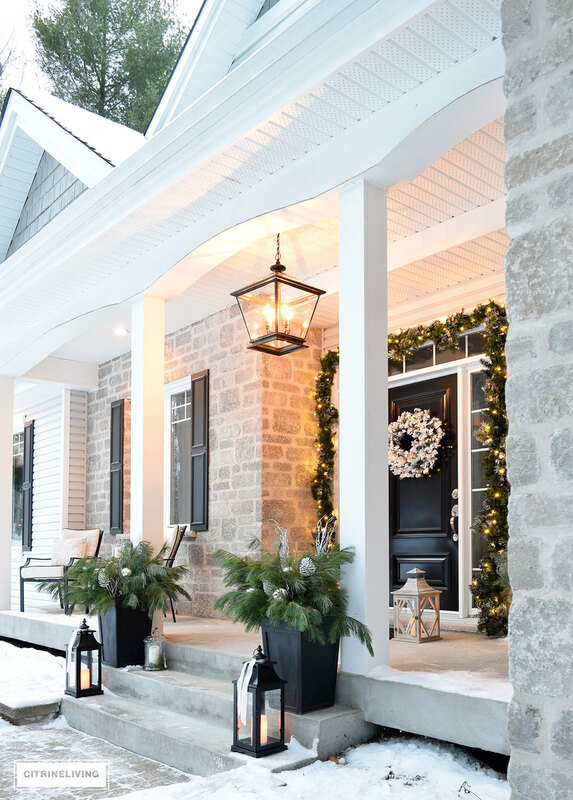 The snow has stuck around since that day (and it won’t be gone before March or April), and I’m happy that it has – well, really only since this post is dedicated to my outdoor Christmas decor and new lighting – which I’m so excited to share with you today! Otherwise, as soon as Christmas is over, I can definitely do without the snow and freezing temps we get here in Quebec. It does make for beautiful scenery though, don’t you think? 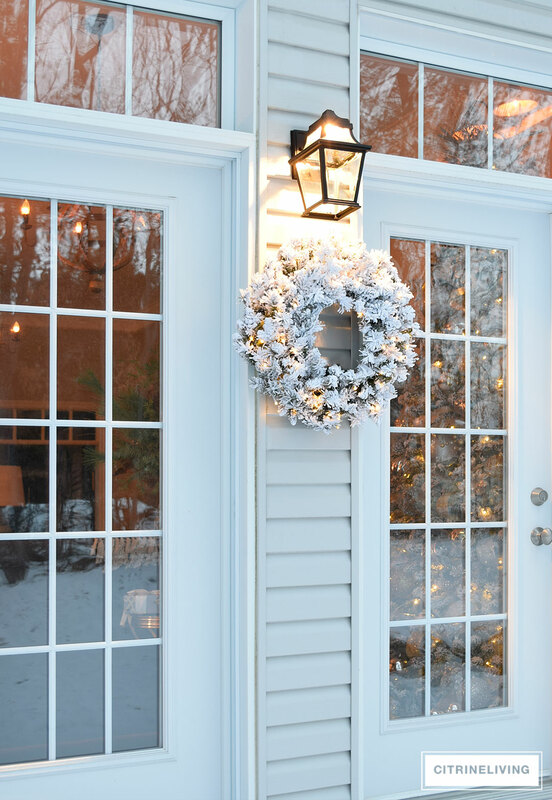 *I’ve partnered with Progress Lighting and King of Christmas for this post. While I’ve received product in exchange for writing this post, all opinions are my own, and I only feature products truly love. Affiliate links are provided throughout, or at the bottom of this post for your shopping convenience – see my full disclosure policy here. 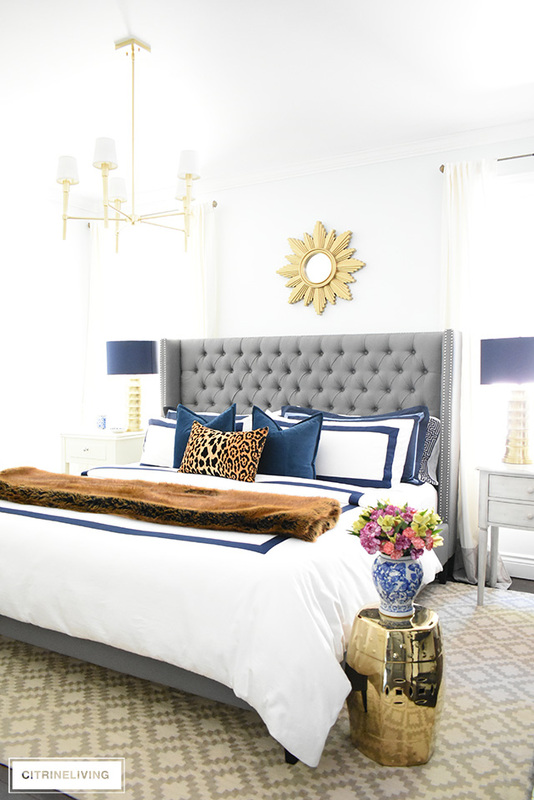 When we first built our home (you may already know this story as well), we built it with the intention of selling it within 2 years, and we made the conscious decision to invest as little money as possible in anything aesthetic, since many of those items would not yield a large return. Well, here we are, 6 and a half years later, and it was time to finally change our outdoor lights. I have a thing for lighting. Making the right lighting choices plays an enormous role in the look and feel of your home. It’s a very personal decision, and says more about your personality than you probably realize. 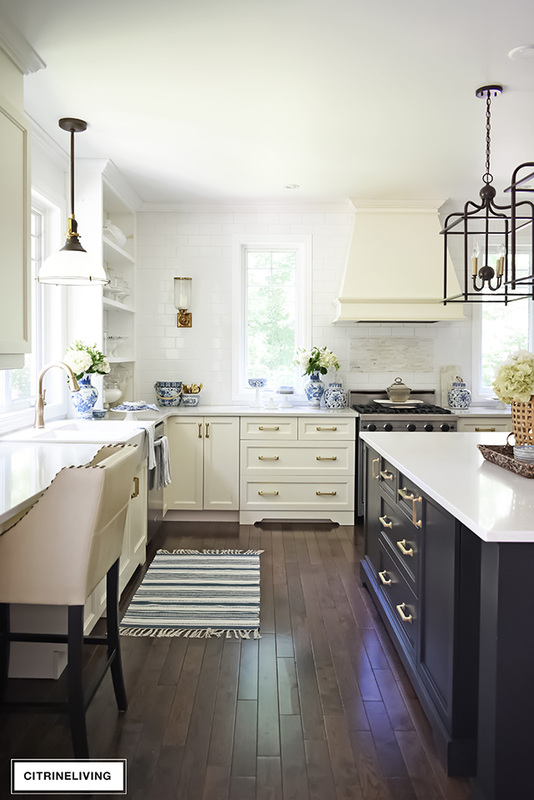 We’ve slowly changed almost all of the lighting in our home…although I do still have a few more to go, and if you’d like to see some of the ones we have changed, have a look at these past posts: Dining Room, Master Bedroom, Kitchen pendant. We’ve also changed the other lights on the rest of the exterior as well. 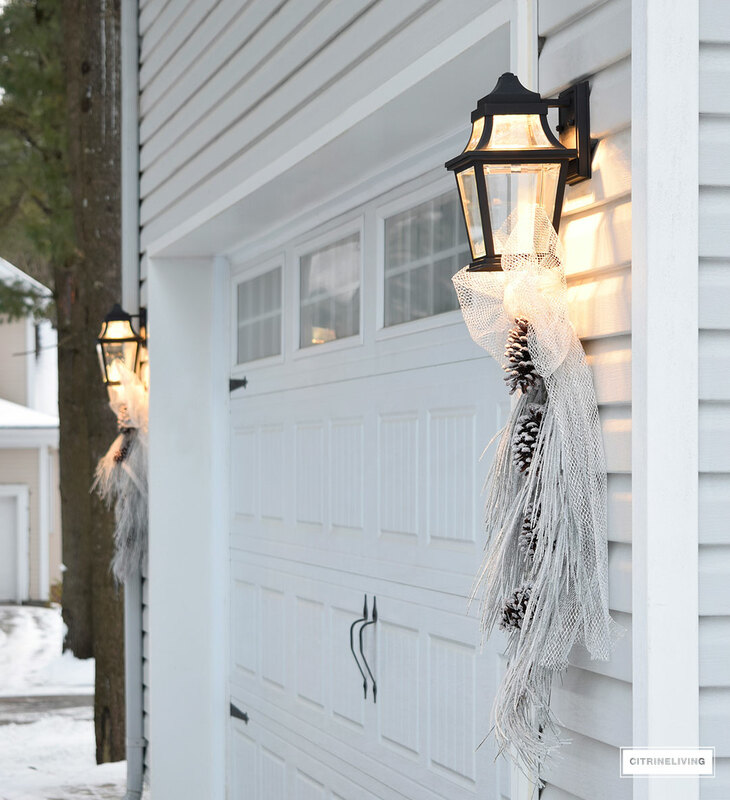 I went with a different style for these ones, because they’re not on the same elevation as the porch light fixture, and quite far away from it, I didn’t feel it was necessary that they match. In fact, the porch light is an interior light (which I almost hung in our entryway instead because I love it so much! ), and has no matching wall sconces. 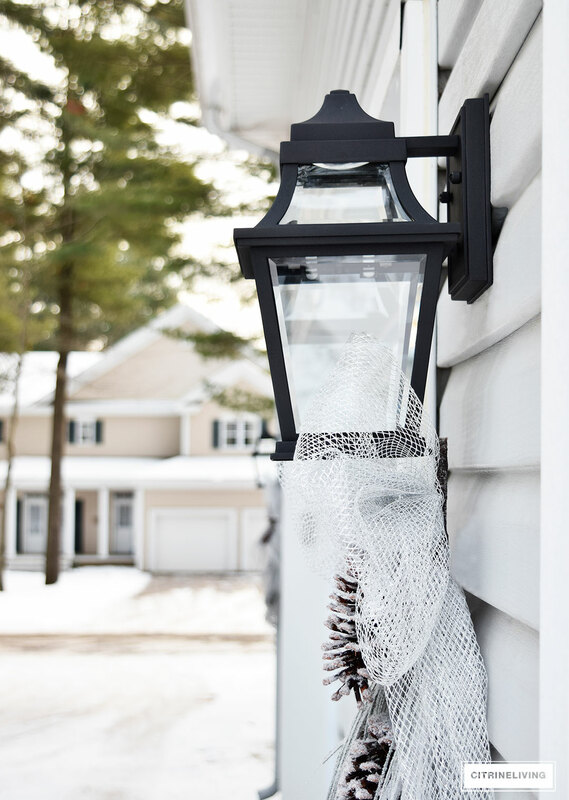 By the way, if you’re going to hang an interior light fixture you should make sure to check with the manufacturer that it can be hung outdoors. Our porch is covered, so it’s totally fine. This light, also a classic design, has the same feeling of a traditional gas lantern, and it’s a perfect compliment to our porch lantern. This is from the Endorse Collection, which does have a matching pendant, if you prefer to have everything coordinate. 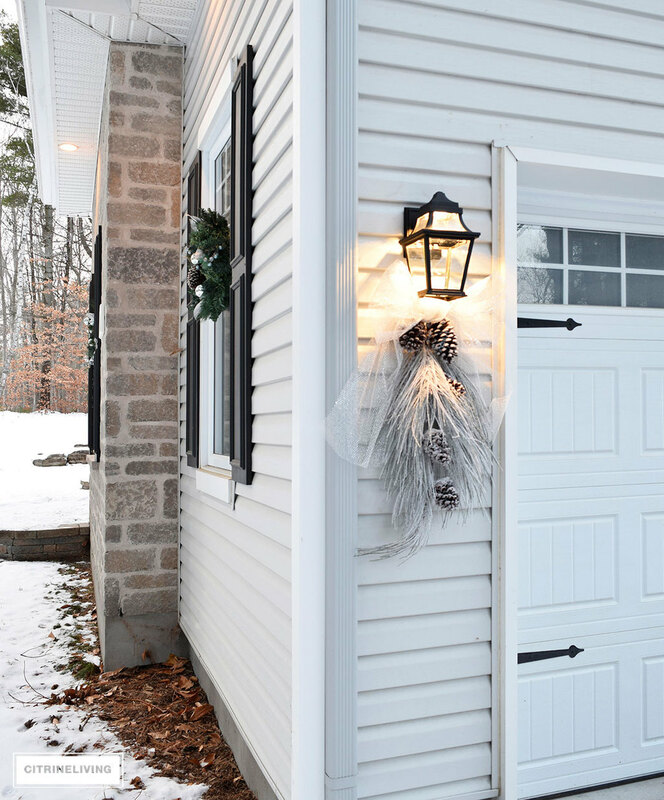 One of the features of this light that I love, is the LED light it comes with – no need for a bulb and it shines through the glass at the top for a beautiful illuminating effect. Keep reading to see how pretty they look all lit up. 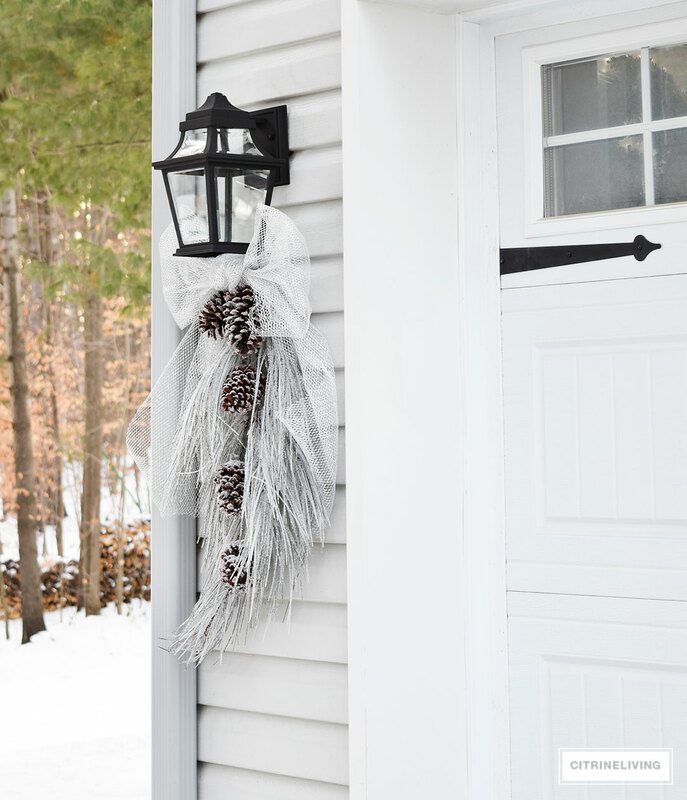 Let’s have a look at the back porch where I chose to hang my new flocked wreath from King of Christmas right below it (we used a 3M removable hook to affix it to the siding). 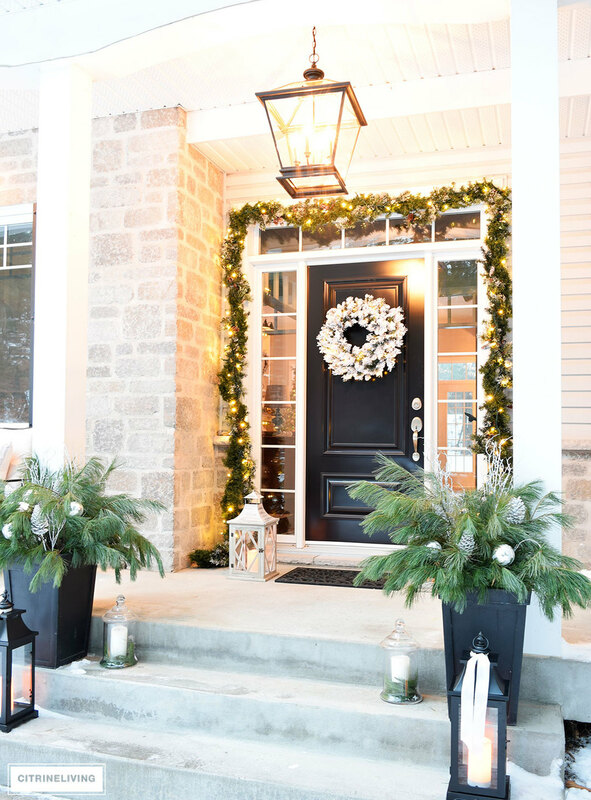 The wreath is prelit and has a timer, which is perfect for cold climates like ours. And here’s our new light, shining bright a few hours later. 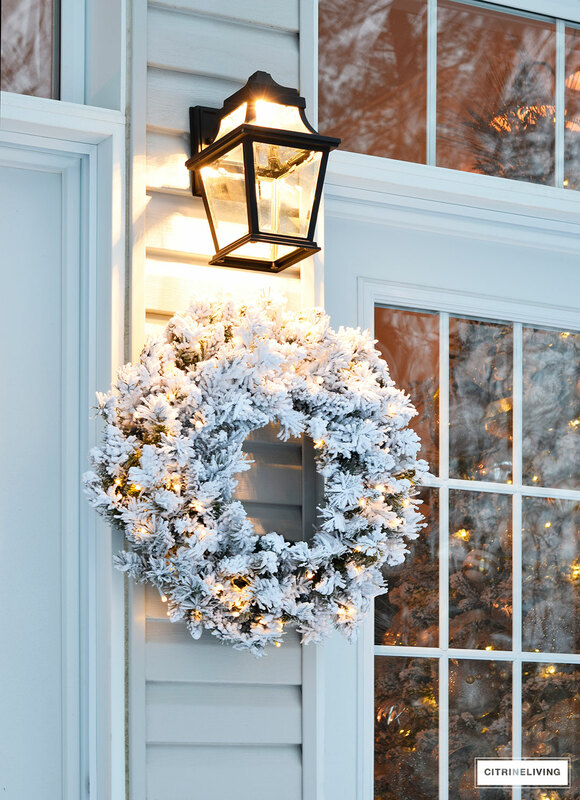 The light quality is really pretty and together with our wreath, it gives a beautiful holiday glow. I love that you get a glimpse of our Christmas tree through the glass here too. 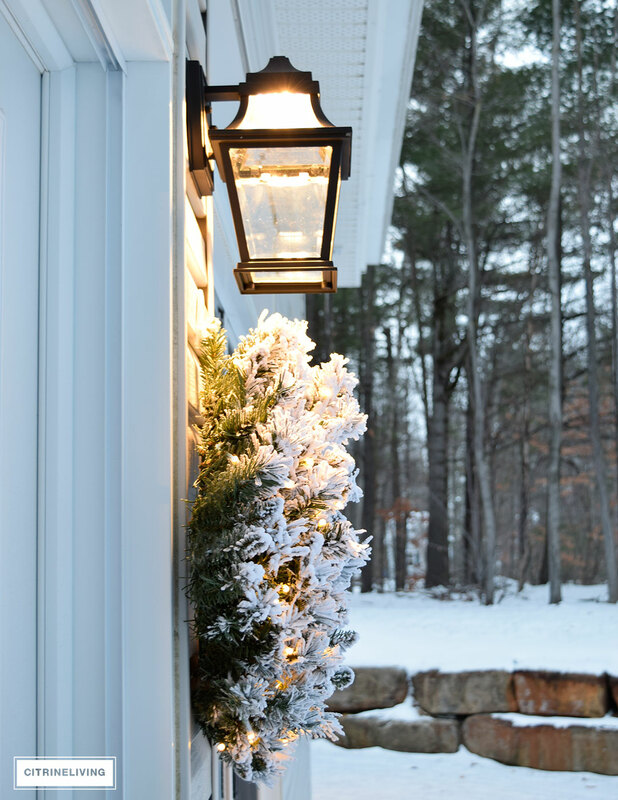 The light shines beautifully on the frosted swags and bows that we hung on the side elevation of the house. 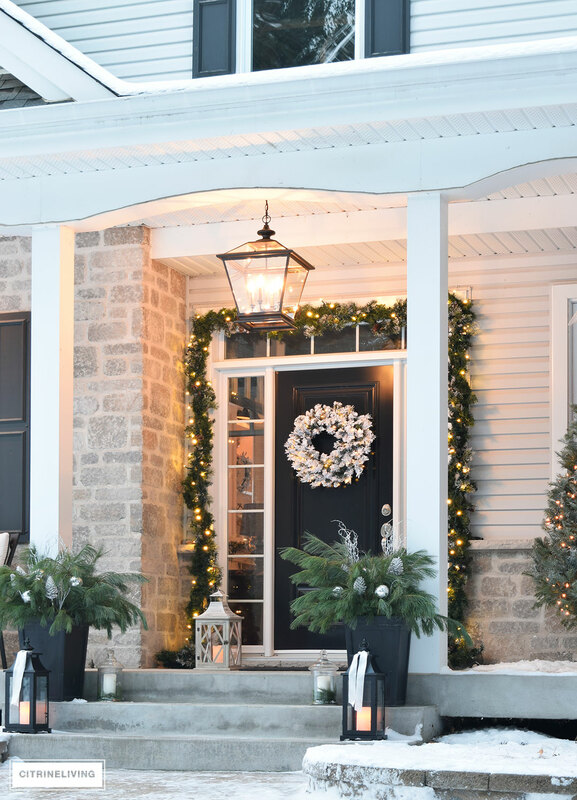 I think next year, I will try flocking my wreaths that hang on the windows, for a more cohesive look. 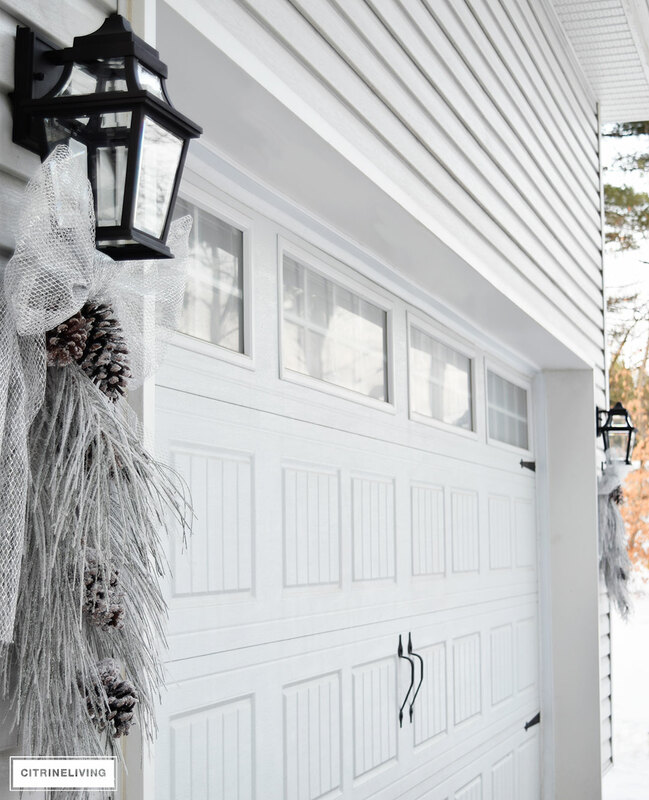 I love these swags I found and that they blend perfectly with the color of our exterior. The glow of the lanterns are so beautiful too. Back to the front porch and my second King of Christmas wreath. 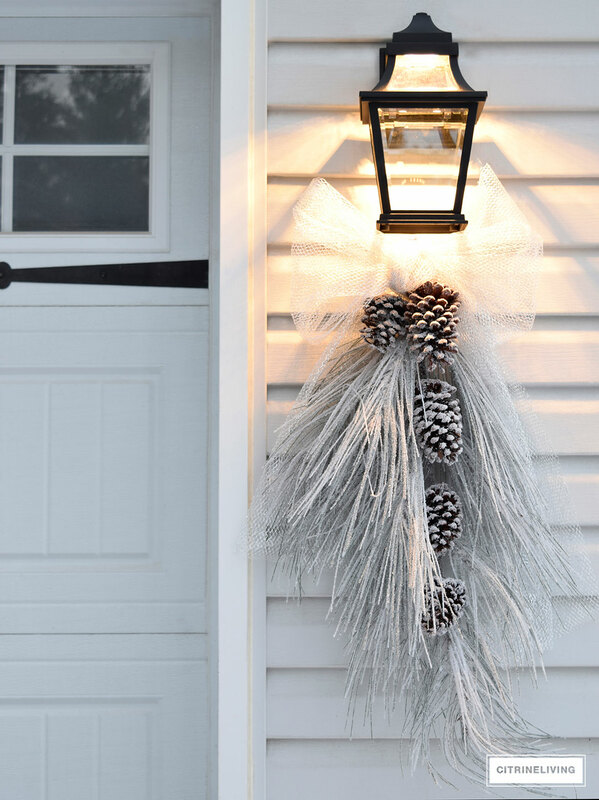 When I started shooting for this post, I had our old wreath hanging up. I was going to use this wreath on the inside of our door and then decided to swap when I came back outside to continue shooting with the lights on. It’s just so pretty when it’s lit with all of the outdoor lights on as well. I wanted more contrast against the black door and it does exactly that. We decided to put up a tree out here for the first time this year, and I used some spray snow to give it a frosted look. It looked too dark in that corner as is and I’m much happier with it now. I don’t change our decor that much from year to year, I truly love a classic look with our garland and potted fresh greenery. To create these pots, I head to my local florist who sells fish cut branches by the bundle. We leave the dirt in the pots all year, and I simple push the branches into the dirt one by one, until I get a shape that I like. Then, I use my silver decorative picks and intersperse them with the pine branches. How stunning is this light? It’s so bright and casts such a gorgeous illuminating glow. I told you I was smitten! 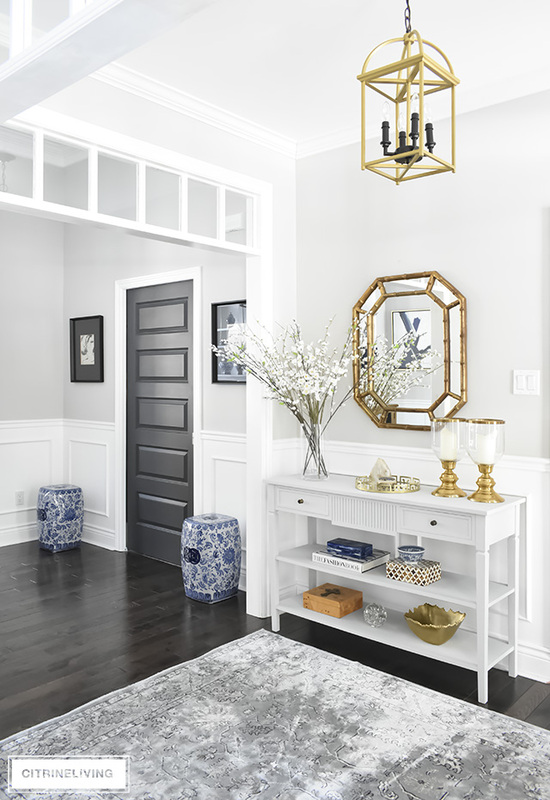 I picked up a coupe of new black lanterns and brought out my glass canisters from the kitchen to complete the look as well. That wraps up my tour of our outdoor Christmas decor and new lighting. 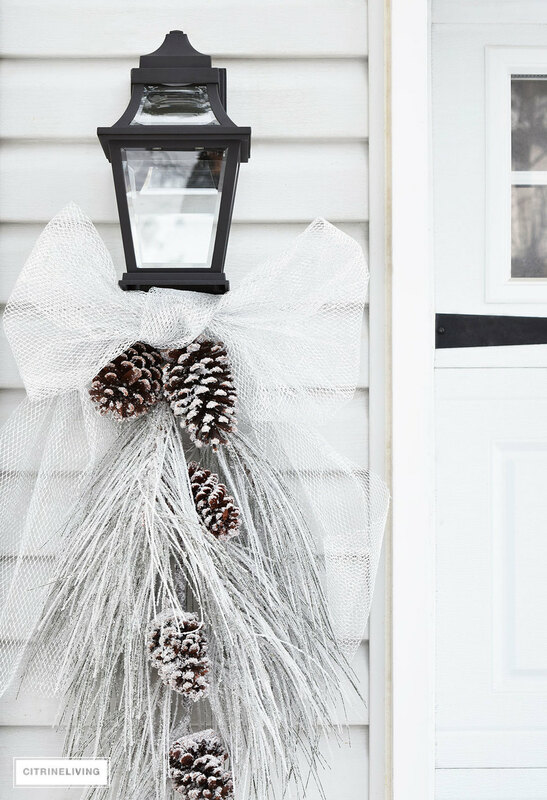 I definitely think next year I’ll be flocking or spraying the darker greens of the garland and window wreaths for more of a frosted look. What do you think? Would you do the same or leave them the way they are? Thank you for reading with me, as always, I love to have you here! Tam, those lanterns are absolutely stunning! I love love love them! 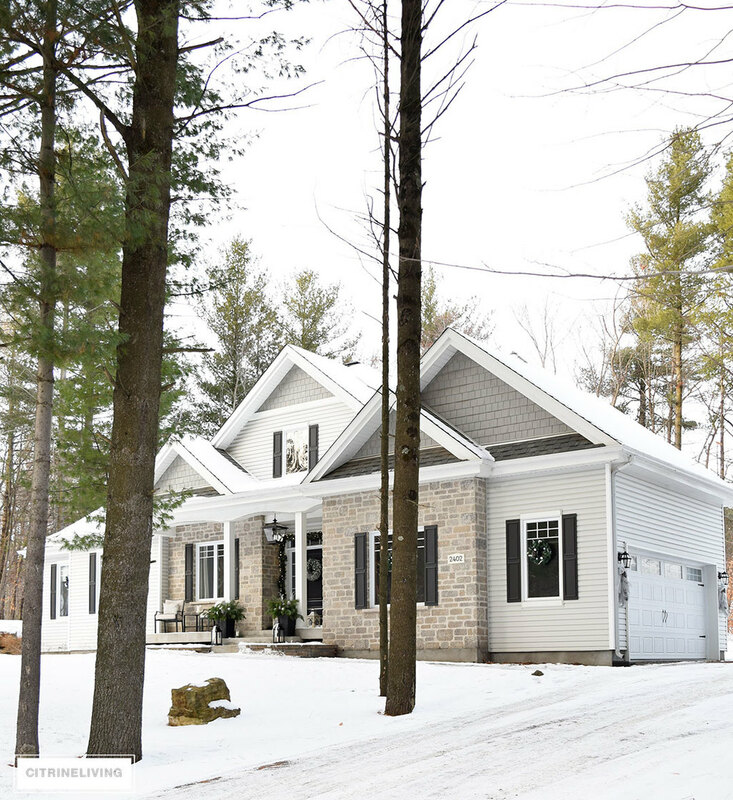 The swags are perfect and beautiful and I love the color of your home… Especially with the snowfall. So gorgeous!! Beautiful! Love all the lanterns as well. Well done! Thank you so much! Happy weekend! Love your new lighting Tam!! 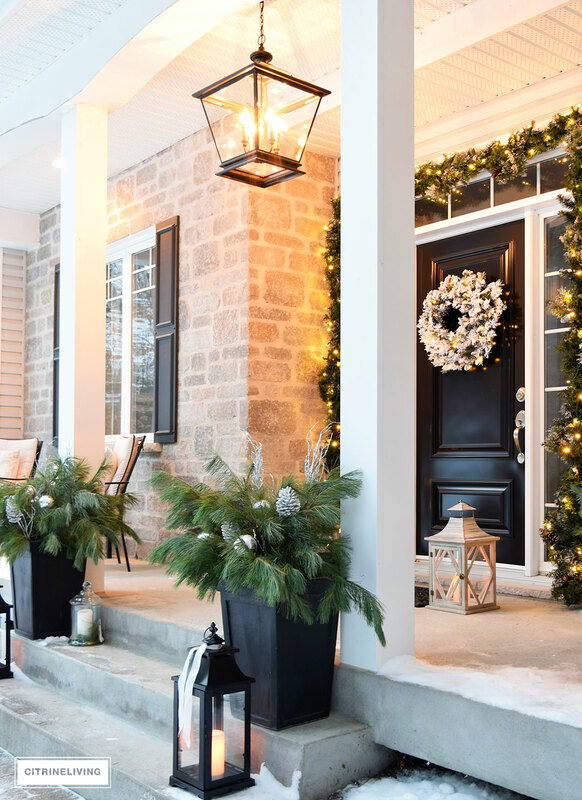 The lantern lit front porch with those beautiful containers are beautiful and so inviting. Love it all! So jealous you have that beautiful snow! Tam, everything is GORGEOUS!! Your lights are fabulous! I love the Christmas decor on them! Classic and beautiful! Great shots! Tam it was like deja vu reading your post because we have horribly dinky lighting flanking our front porch and by the garage and we haven’t swapped it out because we thought we’d only be here two years. 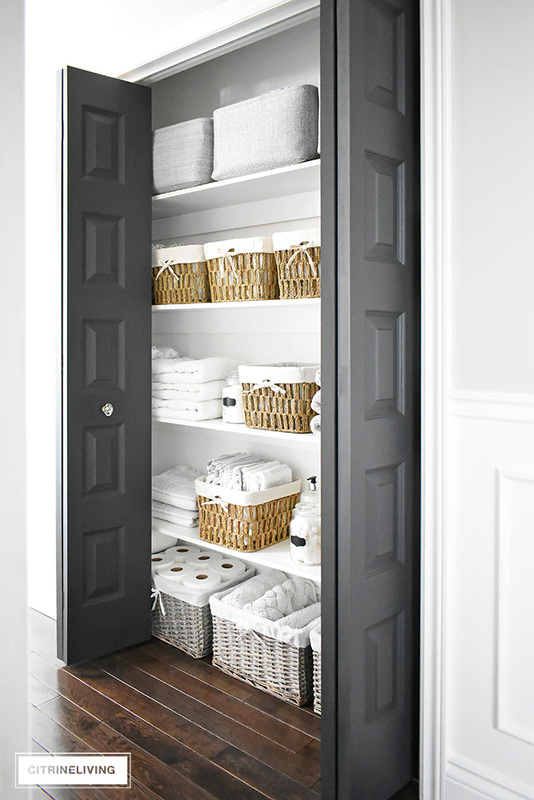 Now that it’s going to be several more, swapping them out is on my 2017 to do list especially after seeing how amazing yours looks – love your choices so much!!! Your house looks fabulous!! Kris! You know my pain haha! I used to cringe every time I would look at our light before, I ALWAYS hated it! I am beyond thrilled with this lighting and am so happy you love it too, thank you for stopping by! Have a great a weekend! Tam these are gorgeous! exactly what i need for my house. i loved them and will look them up for sure. 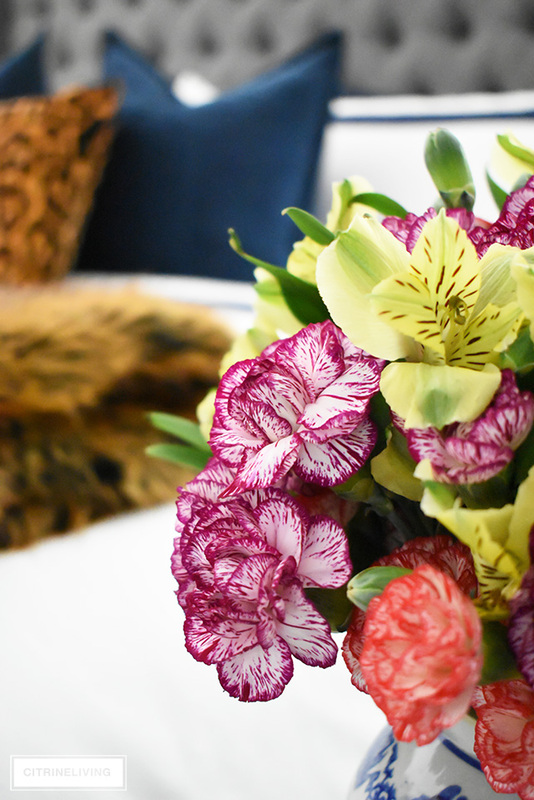 Thanks for sharing… you are making my shopping experience a lot easier! Love it all Tam ! Tamara you decorated everything so beautifully and I LOVE the new lighting! I especially enjoyed how you dressed them up for Christmas – you are so talented! Love Love Love it all!! 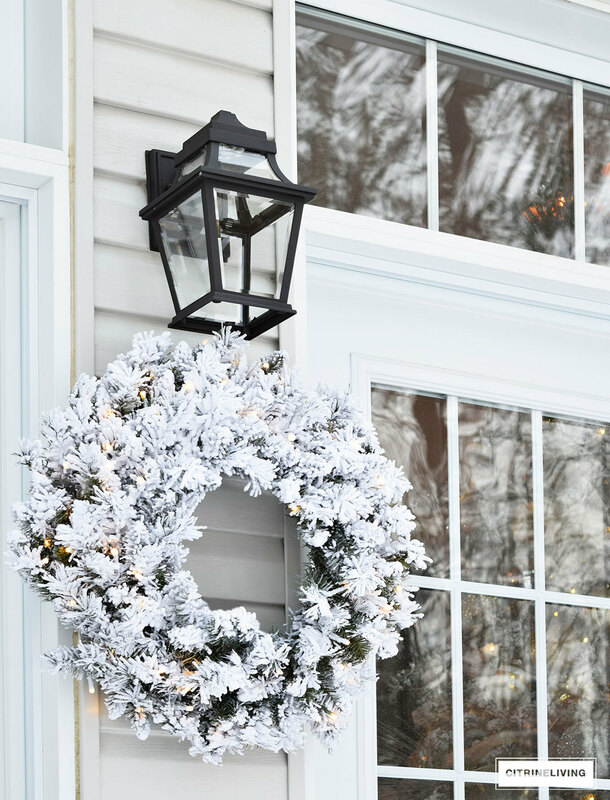 Your Christmas decor is perfect and your new lighting is gorgeous! I think flocking the rest of your greenery for next year would just be the icing on the cake. Tamara you decorated everything so tastefully and elegant. just what I love to see with greenery and light. beautiful!!! Hi Suzanne, Thank you so much for your kind words, I truly appreciate it! I’m very happy you like it :) Happy Friday! What a beautiful and inviting entrance!!!! Gorgeous! Okay, now I want new lights! They are beautiful Tam! Gorgeous Christmas decor too. Timeless! I LOVE the lights and the front one sooo much…gorgeous. 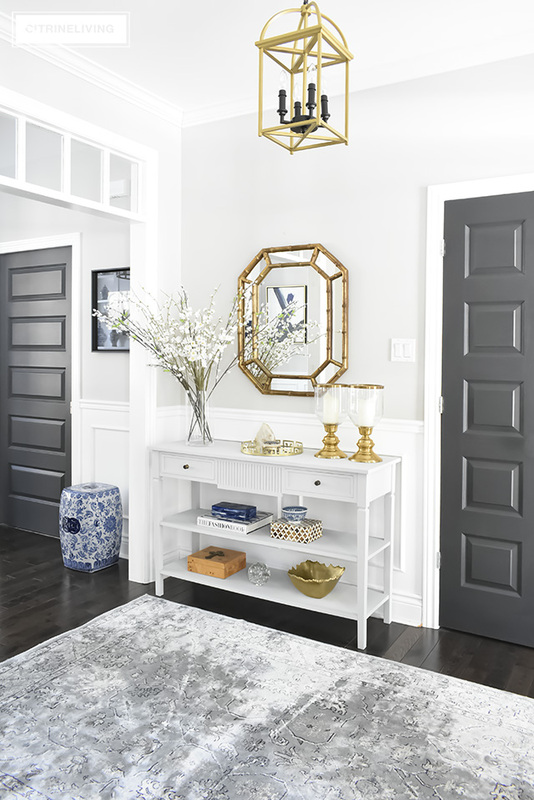 it continues with the dining room chandelier, as the next light you see after entering your home! They’re both similar!! I love your lighting choices. Your entire home is beautiful! 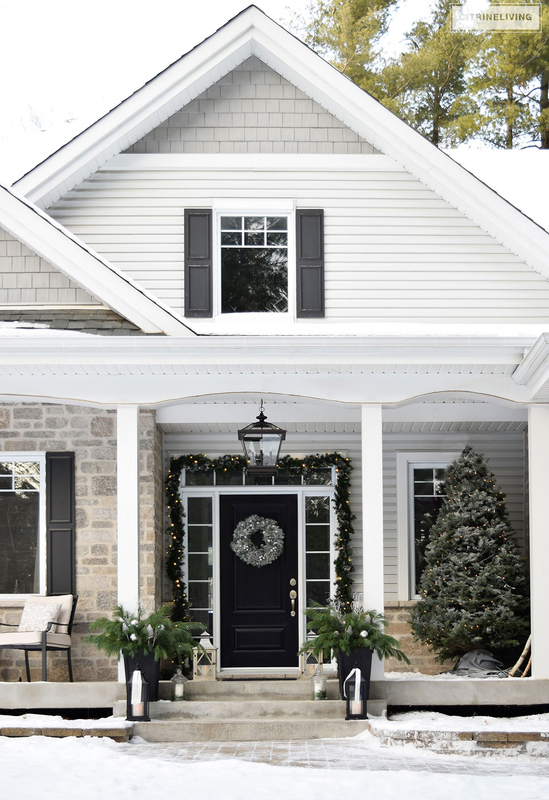 One question- Is the out door front porch crest wood pendant the 3 or 4 light size? It is hard to tell from the pictures.. Thank you so much, I truly appreciate it! This is the 4-light option, and I have it linked right here in my blog, if you want to purchase through my site :) Thank you so much for stopping by and I’m so happy to have you here! I ordered the 4 light fixture. What a great find at a reasonable price. It is just what I wanted for my front porch. Thanks for sharing your design talents with all of us. 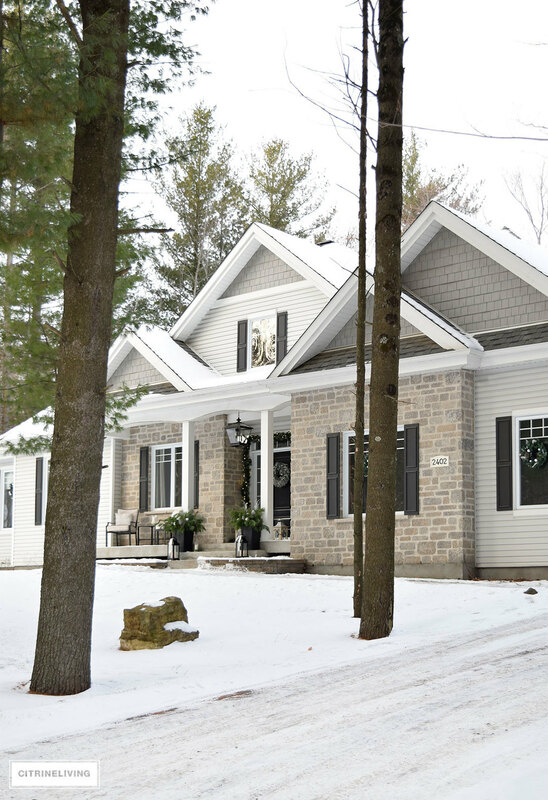 I’m particularly interested in the exterior stone on your house. You wouldn’t happen to know what it is would you? We’re doing exterior work next year and would love to use this stone in particular. I wish I knew what it is! We chose everything through our builder many years ago! It’s a mix of warm and cool grey tones, and the grout is flush with the stone so give it an ‘old’world’ appearance. I hope that helps! Hello! I am in love with your home! Hoping you can share your paint colors!? Merry Christmas!